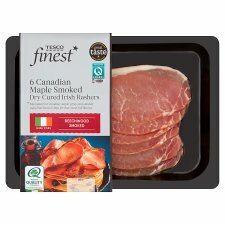 Smoked dry cured back bacon Irish rashers with maple syrup. Irish pork, hand rubbed with sea salt and dry cured for over 7 days for a meaty texture and rich flavour. The bacon is then marinated in Candian maple syrup and smoked over beech chips. INGREDIENTS: Pork (92%), Maple Syrup (4.5%), Sea Salt, Maple Extract, Preservatives (Sodium Nitrate, Sodium Nitrite), Antioxidant (Sodium Ascorbate). Place under a pre-heated medium-high grill for 6-8 minutes, turning once. Fry in a little oil over a medium heat for 6-8 minutes, turning once.